Today I thought I'd share how I make my Red and White Speckled "Graniteware/ Enamelware" Looking Country Eggs. I do both the white based with red specks and also the red base with white specks. I love them both! I was thinking that some people may want to make these for display with Easter right around the corner. But as for me, I keep mine out all year long. They look awesome with the red and white speckled "graniteware/enamelware" themed other items I have in the kitchen also. First, I start off with some basic, crafting plastic eggs. You can find these at Michaels or sometimes you get lucky and run across a bag of them at the Dollar Mart! These are not the type that you can pull apart, they are full eggs, in one piece. They are plastic and hollow inside. I was lucky enough to find these in huge bags of 40 for only $1.19 at the Dollar Mart last year. My buggy and arms were full! And please note that I did buy them all except for one bag. Which I left in case someone really needed them. lol. Some of mine in the tote are dented due to being stored at the bottom of a huge stack in the garage. lol. But I am still going to use them. The next step is to simply spray paint them with a base coat. I use the $3.00 red from the Dollar Store and the $1.50 white. The little bit higher red tends to cover better than the dollar kind. Do not try to paint them on something like a plastic bag. They will stick and get lines....I tried. The best thing I found to paint them in was a cardboard box lid. The gift box type. Once painted they can even roll around and it will not mess up the paint too much. I do a box full of both white and red as the base. Then let them dry a bit, roll them around and spray the other sides. Then just let it all dry again. Now comes the toughest part....but don't worry, it's still not hard. It's the time to add the "speckled look." And getting it just right is not necessary. But here's a trick. Practice over something like an empty box until you get the hang of it. I just barely.....and I mean BARELY press down on the spray button on the spray paint to just make it kind of "spit" the paint out in little specks. And I hold it over top the eggs. Probably about 2 foot or so above. That way you will get the little dripping effects. You can see some of the big drips that also fell in the box. It hit a few eggs to, but even they still looked kinda cool in the end. I forgot to take a pic of the red based ones with white specks, but they are just the same as above, but vice versa colors. I put them in these clear bags and just add a label and sometimes a string of homespun to make them look super country. I do sets of 2 for only $1.59 or sets of 4 for $2.79. The sets of 2 go faster than the sets of four, I am guessing because of the $1.59 price. And that people may add them to their own groups of eggs they already have. And here's how I display some in my own kitchen. They are all nestled inside of a wire chicken frame that I found at a yard sale for only $2.00. I need to go back and add a touch of that fake nesting grass under the eggs. Ah, I'll get to it one day. 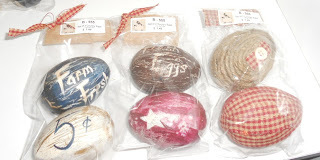 Well, I hope this gives you some ideas on what to do with those plastic craft eggs you may have laying around. I'm pretty sure this will also work on those left over Easter eggs as well. They'd just have the seam in the middle is all. 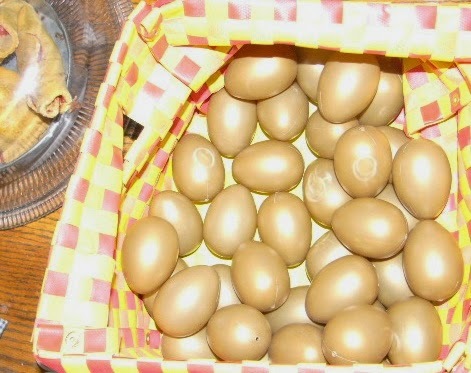 And if you are looking for a more primitive, country theme to do on plastic eggs, check out my recent post here: PRIMITIVE "COUNTRY THEMED" EGGS. You've inspired me by finding this comment! I really didn't think that anyone read this, and I was about to give up on posting.. So glad you stopped by! Because I love making these things to share, and it means a lot just to realize someone does read this!!! Thanks much, Lisa! !